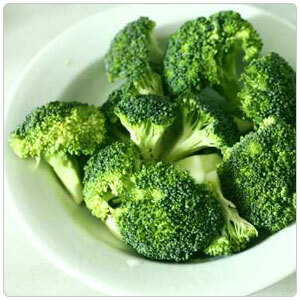 Broccoli is the dense, unopened budding sprouts of a member of the cabbage family. Other members of the brassica family include kohlrabi, cauliflower, Brussels sprouts, kale, collard greens, and all the cabbages. It grows like a tree with a thick, edible trunk that sprouts leaves/branches. It has clusters of small, tight flower heads that turn bright green when cooked. Once fully mature or bolting, the flower buds will sprout golden yellow edible flowers. Often used, seldom praised and the subject of many jokes, the numbers surrounding broccoli are impressive. California grows 80% of the nation's crop with 115,000 acres planted with a yield of 8 tons per acre in 2009. The nutritional description is packed with phrases such as 'high in vitamin C, dietary fiber, anti-cancer, anti-viral and anti-bacterial properties. Good color indicates high nutrient value. Broccoli that is dark green, purplish or blue/green contains more fiber and Vitamin C than paler bunches.